(16/58) TRENTON – Cannons will roar and bayonets will clash once more in the fields and hills of northern Monmouth County as Continental Army and British-led re-enactors descend on Monmouth Battlefield State Park this weekend, June 18 and 19, at the site of a critical Revolutionary War battle. The crucial Battle of Monmouth will be recalled at the battlefield on Saturday and Sunday at the park, 16 Business Route 33 in Manalapan. Encampments at the park will open to the public at 9:30 a.m. both days, with the battle re-enactments scheduled at 2 p.m. Saturday and 1:30 p.m. Sunday. The events will conclude at 4 p.m. on Saturday and 3 p.m. on Sunday. A $10 per vehicle parking donation will be requested to help defray event costs. The re-enactment weekend is co-sponsored by Friends of Monmouth Battlefield and the Department of Environmental Protection. The story of Molly Pitcher, who was born near Trenton in 1754 and became a heroine of the Battle of Monmouth, will be told on both Saturday and Sunday. Molly Pitcher, whose real name was Mary Ludwig Hays McCauley, reportedly carried water to cool off cannons, and to aid soldiers. That assistance led to her nickname. Legend has it that when Pitcher’s husband collapsed or was wounded in battle, she replaced him in the gun crew and helped load cannons for the remainder of the battle. 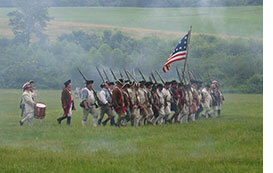 The 3,000-acre Monmouth Battlefield is one of New Jersey’s premier historic sites. The crucial battle took place on June 28, 1778 when General George Washington’s Continental Army intercepted an army of British, German and Loyalist soldiers fleeing from Philadelphia to New York to escape an impending blockade of the Delaware River by a French fleet. While the British-led troops escaped that night, the battle established the effectiveness and viability of the Continental Army and is considered an important strategic and political victory for Washington. The annual re-enactment of the Battle of Monmouth is an engaging step back into history and the critical role that New Jersey played during the American Revolution. Visitors to the event will pass enlisted men engaged in cleaning their weapons or other camp activities, and may see the women who worked in the camp cooking, mending or washing. Still others may encounter a drum major drilling his musicians or witness a court martial. At the parade ground, soldiers may be found drilling or artillerists may fire cannons. Other highlights both days include formations and marches by the British and Continental armies, and a wooden musket drill for children. The battlefield also is home to the award-winning Visitor Center that opened in 2013. The nearly 13,000 square-foot facility includes windows framing a panoramic view of the rolling terrain upon which the Battle of Monmouth was fought. Fascinating and engaging exhibits are complemented by park interpretive specialists who bring to life the battle that unfolded on the farmland outside the center’s windows. The center also has a theater and exhibits that show how the battle unfolded, from the chance encounter of the British-led troops, through the bloody fighting in the merciless summer heat, and onto the final escape of the British forces toward safety at Sandy Hook and New York City. For questions about re-enactment activities in case of inclement weather, please call the Monmouth Battlefield State Park Office at (732) 462-9616.